In the EPC model, to display the relationship in the RACI visualization tab as well as in the RACI reports, I read on previous posts of Aris forum to use the connection “is IT responsible for” or “is technically responsible for” but now they don’t work. I’ve found that to display the role A, the right connection is “Decides on” CT_DECID_ON. Is the only connection available? Is it change from Aris Cloud 9 to 10? The A for "Accountable" identifies the person ultimately answerable for the correct and thorough completion of a task.The decides on and accepts connections are evaluated in order to mark this responsibility. As far as I know this has not been changed between ARIS 9 and ARIS 10. Hello, I have problems too with RASCI connections because ARIS 10 changes the type of the connection to generate the matrix. We have defined all connections as ARIS used to be and now in ARIS 10 change a lot!! 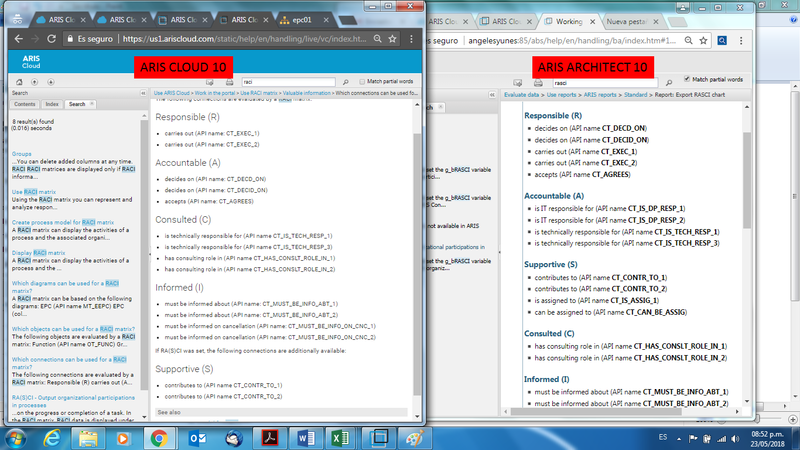 I attached an image with ARIS Cloud v.10 help and ARIS 10 Architect help and it's different. How do we handle this changes? I mean, does Software AG may evaluate to return to old functionality? or we need to customize connections? I hope not!! !